This is one of a Ka-trillion things in the back of my mind. I “almost never……never” watch broadcast TV, so I had no idea as to the real status of this. I did some checking and found out a few things. Wisk has an illustrious past. Wisk is no longer around. In 2008, Sun Products bought Wisk, and later a company named Henkel bought Sun Products, and then discontinued Wisk, replacing it with Persil Pro Clean. Looking at posts online, there are many long and loyal customers who are upset about the changes. Maybe I’ll start a “Consumer Hall of Fame Museum. I could include Wisk, Pop Rocks, Fluff, Tang, and some of the other TV ad “Giants” from my moronic TV watching days. Side note; Tang being the fruit flavored powdered drink developed by General Mills in 1957 by William A. Mitchell, who would go on further to invent two culinary staples; Pop Rocks, and Cool Whip. As it turns out, Tang wasn’t developed for the space program, it only became popular when it was used by the space program in food testing years later. I didn’t know Wisk was gone! Thanks. 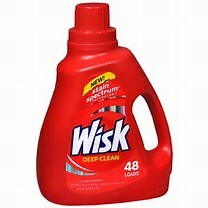 I was just wondering what happened to Wisk. JK 😉 Hahahaha.